Here’s a new obsession for the media world: The Techmeme team just launched a new site mingling algorithms and human editors–and this one is chronicling the most important print, digital and TV media stories of the day. 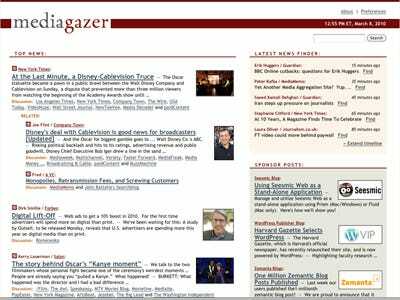 Mediagazer launched today, adding on to Techmeme founder Gabe Rivera’s other verticals including political roundup Memeorandum, celebrity-focused WeSmirch, and Ballbug for baseball news. Editor Megan McCarthy said she will be in charge of of the new vertical, while the rest of Techmeme’s team will will focus on their main site. The site includes Techmeme’s signature features, including sharing capabilities. There are also two mobile sites: mediagazer.com/m or mediagazer.com/mini. Although plenty of media professionals often check sites like Twitter and Poynter’s Romenesko for hot links to media must-reads, Mediagazer is sure to attract refreshes from writers and TV industry folks alike. So much “media on media” gets published across all kinds of sites, it’s hard to keep track and shift through the noise. It’s also a convenient way to keep on top of the competition and see how other sites are interpreting the top articles of the day. So Mediagazer could become one of the most successful of Techmeme’s off-shoots as another must-read for the industry.